The UN children's agency Unicef says efforts to save and improve the lives of North Korean children are working despite continued political isolation. Unicef head Carol Bellamy said co-operation with the authorities has boosted immunisation and given better access to medicines and clean water. But she said the country was still suffering serious economic decline. Many youngsters remain extremely vulnerable to illness and deaths that are preventable, she added. 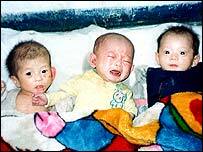 Unicef estimates that about 70,000 North Korean children are at mortal risk from severe malnutrition. Ms Bellamy, who has just returned from a trip to North Korea, said the situation was much better than when she visited in 1997. "There are enormous challenges here," she said. "But we are seeing real results for children and that's what counts. It's vital that we stay here and expand our work. "I'm convinced that by helping children survive and thrive, we're contributing to a stronger, more peaceful Korean peninsula." She said she had seen vast improvements in the immunisation programme against basic diseases, with 80% of children vaccinated compared with 35% in 1987. Pyongyang had now opened up 162 of 200 counties to Unicef, she added. But the fund was moving beyond providing food and medicine and looking to improve the quality of education in North Korea, Ms Bellamy added. She said the new three-year programme was a "little breakthrough", which would attempt to bring "a little more reality" to the country's highly ideological school curriculum. Unicef North Korea representative Pierrette Vu Thi told Reuters news agency that under the scheme children would be taught about HIV/Aids, hygiene and children's rights.